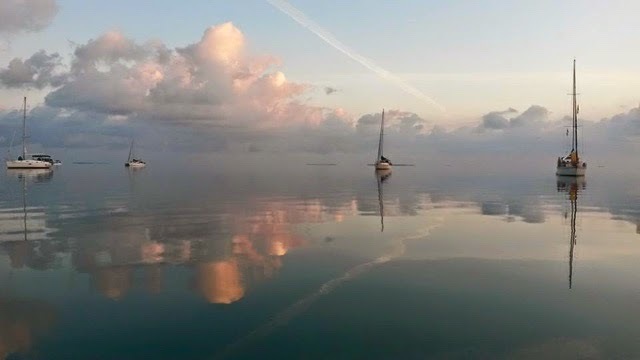 As Glory Days bobs and sways peacefully on an anchor in Key West this week, I wanted to take a different direction with the typical blog posts. a very interesting person I've met on two different occasions in my cruising time. Also, I'd like to note, The Glory Days sailing blog is about to pass the 20,000 mark for number of visitors from folks just like yourself! Thank you for following along… There's still a long way to go…. now here's a story about a Woman On An Adventure Quest. "You meet people who forget you. You forget people you meet. But sometimes you meet those people you can’t forget. Those are your friends." Sometimes people come into your life for unknown reasons. Maybe it's to enlighten you, to inspire you, to challenge you or just to teach you new things. Or maybe it's to make you take a deeper look at your own self. 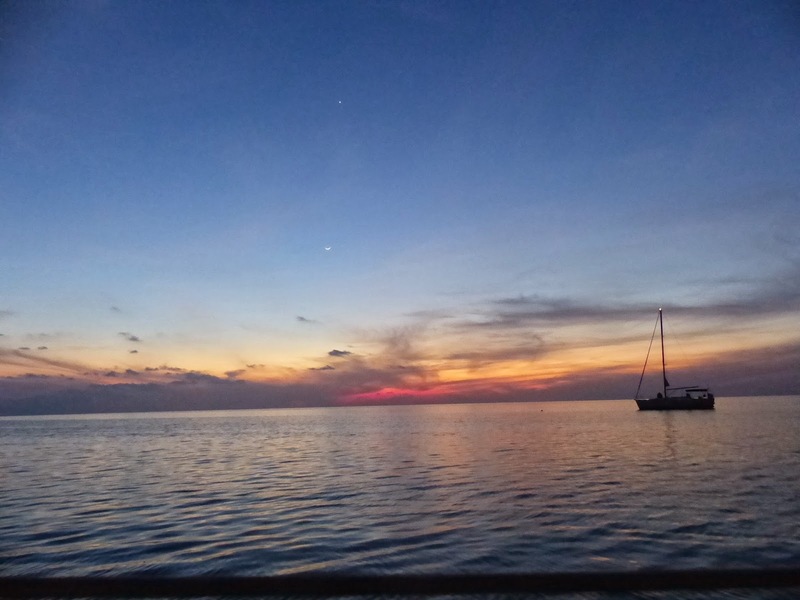 I've said it so many times before but it still holds true... "The cruising lifestyle is marvelous and adventurous, but it's really all about the PEOPLE you meet along the way that makes it so rewarding. 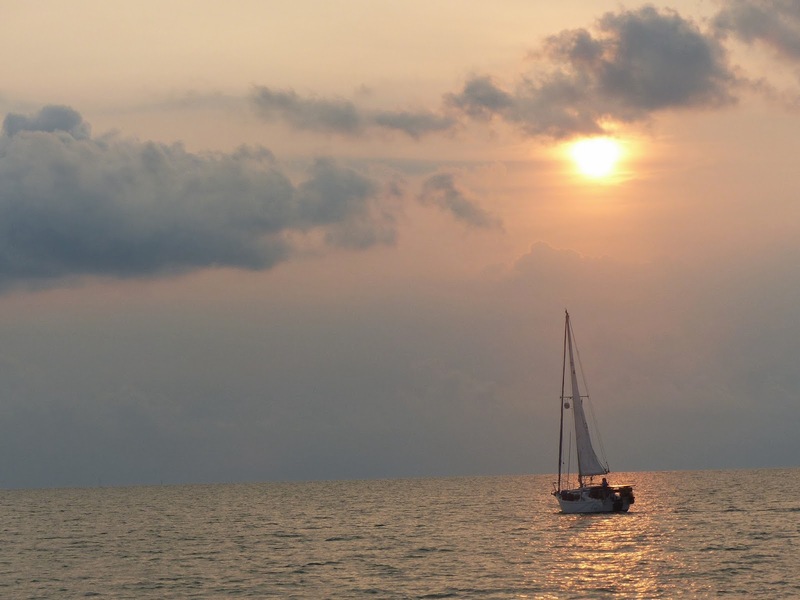 Sometimes cruising seems like a continuous stream of new folks you meet in your travels. I find it interesting that these random acquaintances can often seem like long lost friends that you've known forever. I suppose it's because of the common bond of sea, travel, and the endless commonalities for why you chose this type of lifestyle in the first place. 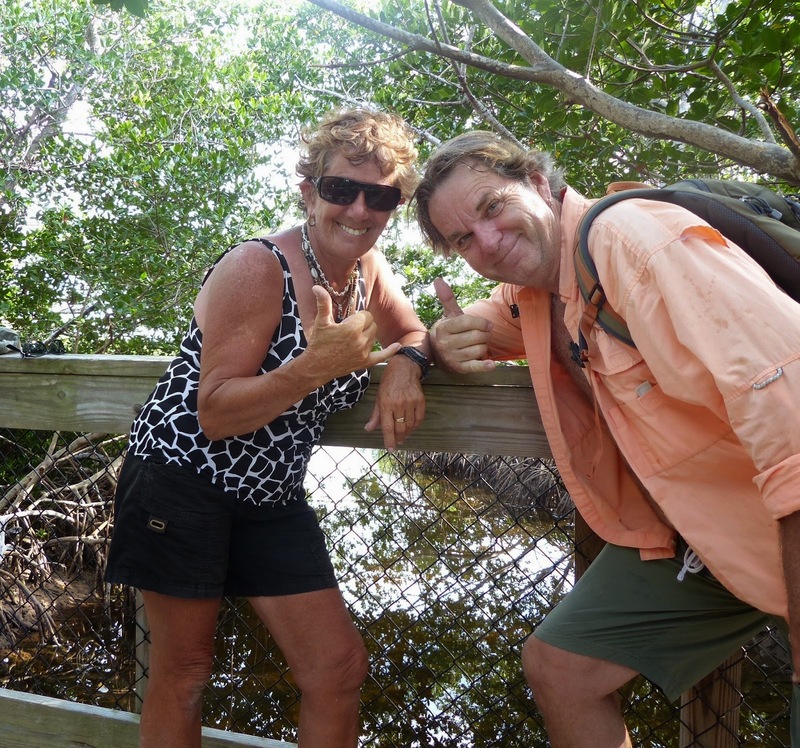 Last year when I was passing through Hopetown, Bahamas, I had the pleasure of meeting one such person-an amazing woman named Diny Van De Loo. 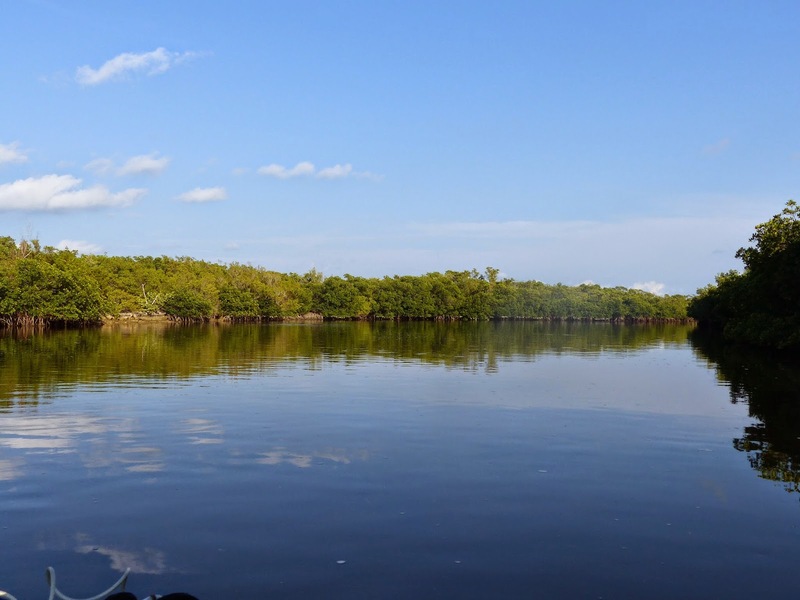 I was paddling my dinghy around the harbour just as she was dropping her anchor after entering Hopetown in the Abaco Islands of the Bahamas. I said hello and the friendship began. Meet Diny Van De Loo. Diny is a the quintessential world traveler. I really think she has been everywhere. Her bucket list is long, and the places she has traveled while serving others is astounding. At last count, she has visited 55 countries: 22 in Europe, 12 in Asia, 4 in South America, 10 in Africa, plus Canada, New Zealand, Australia and the list goes on and on. She is of Holland decent but now considers Colorado her home base, tho she is rarely there it seems to me. 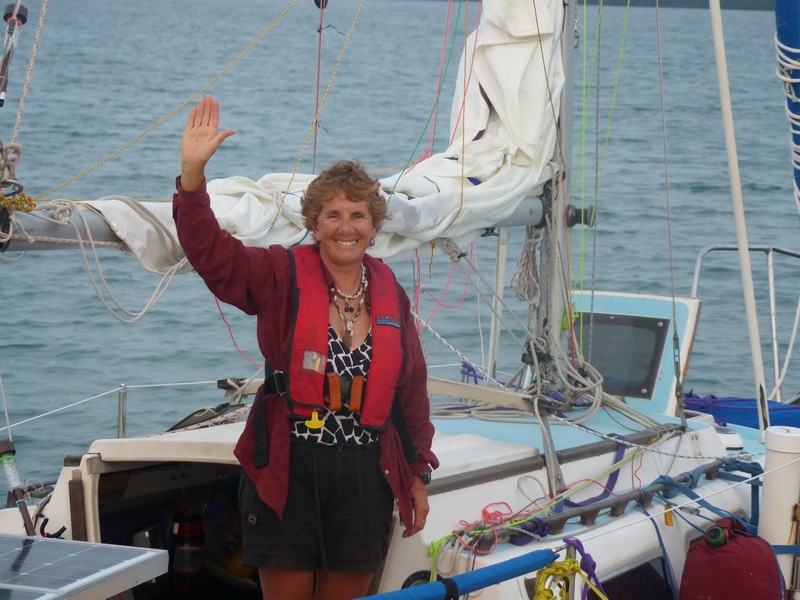 The past few years she has spent sailing all around Florida and the Bahamas between international excursions. But it's not just the places she's been, she brings cheer and good vibes everywhere she goes. She's a happy-go-lucky philanthropic soul with a huge heart. Her professional occupation is a nurse…a global nurse I might add. Diny is the captain of her own vessel, figuratively and metaphorically. 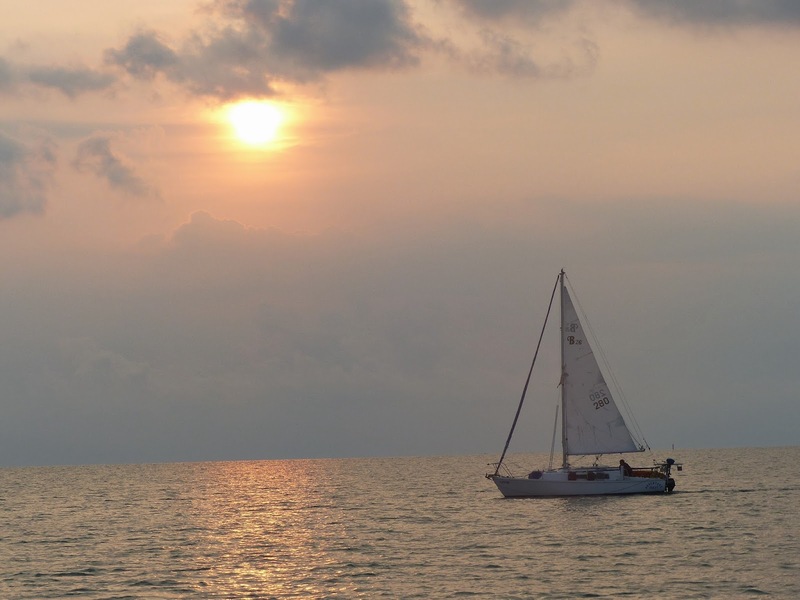 Her vessel, which she affectionately calls her little "shiplet," is a 26' Balboa sailboat aptly named "Adventure Quest." Since she is also a single handler, like myself, we had an instant connection. 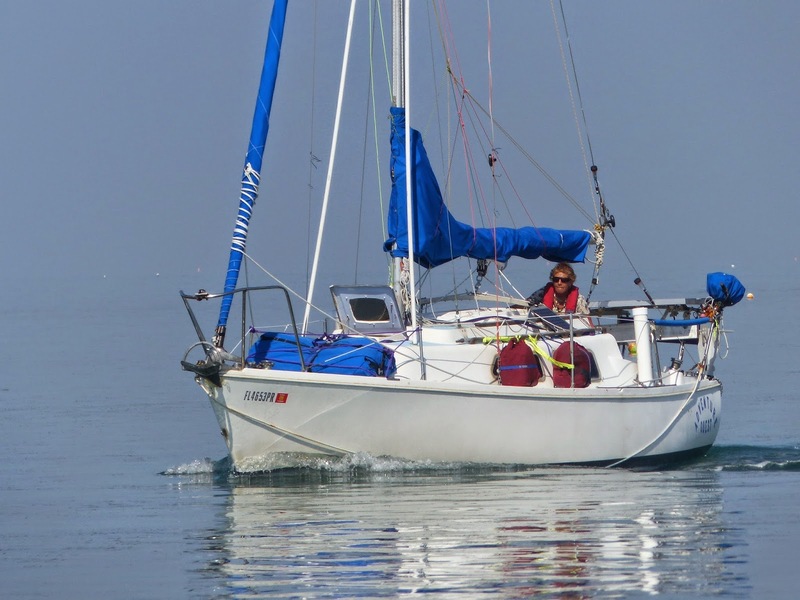 When Diny told me she only paid $3000 for her boat, I knew then and there that the cruising lifestyle is not a choice one makes out great wealth, but out of sheer will and determination. 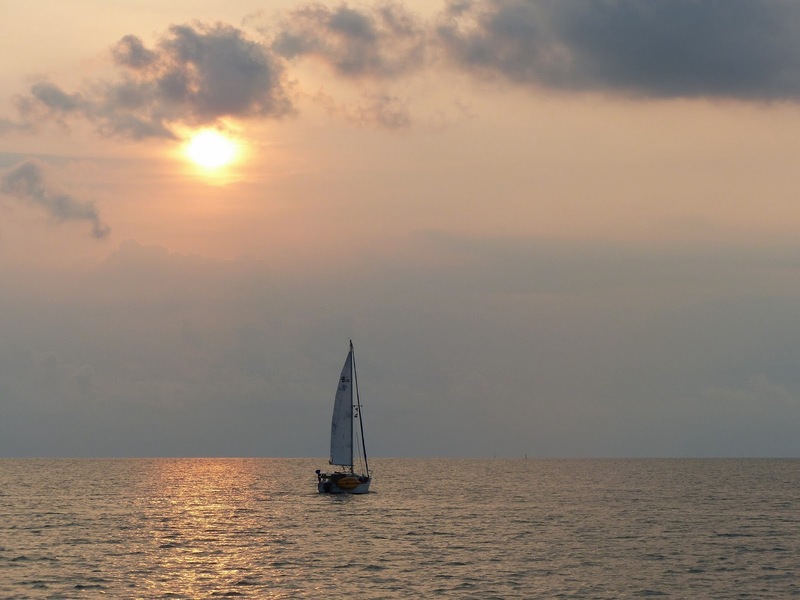 It does not take great wealth to live the cruising lifestyle, but persistence, drive, passion, and determination plus a little ingenuity at times. 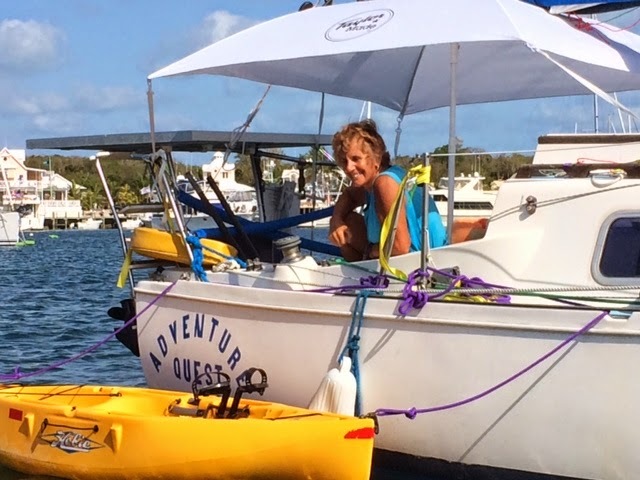 Adventure Quest may be a tiny boat in some respects, but she is fully outfitted for safety and comfort. I had the pleasure of visiting this shiplet on two occasions now, for friendly fellowship and great food and hospitality aboard. 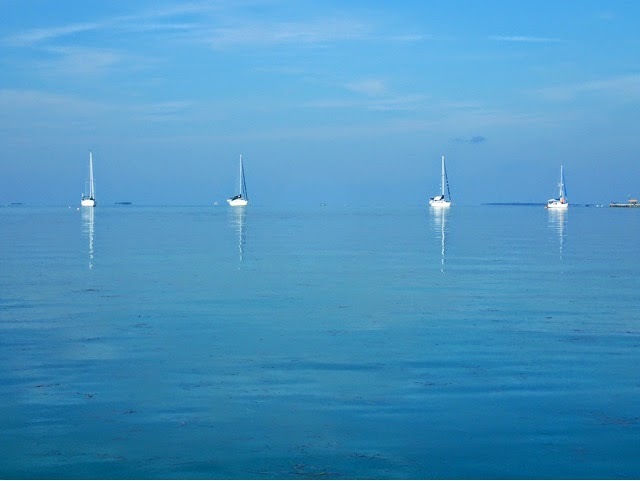 While in the Bahamas last year, we opted to travel together for about a week, a term commonly called "buddy boating." and sooner or later our paths did cross again. 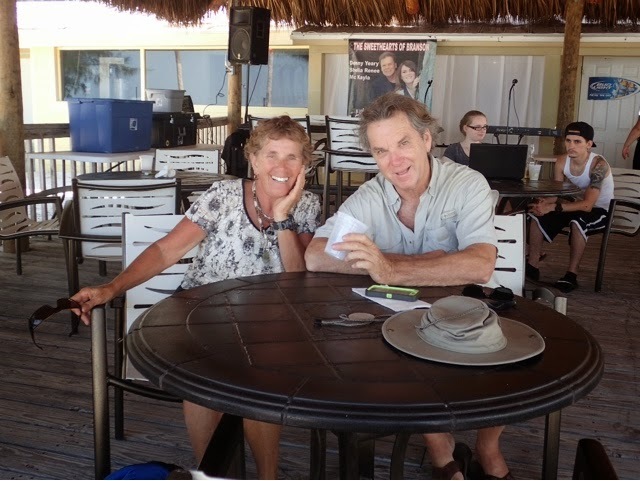 here are a few photos from our recent reunion here in the Florida Keys. You will notice her boat is well outfitted for a small craft. Every inch of space is accounted for. Unlike most cruisers, her craft does not have an inboard diesel engine, only a 15 hp Mercury outboard with extra fuel tanks strapped to the deck. 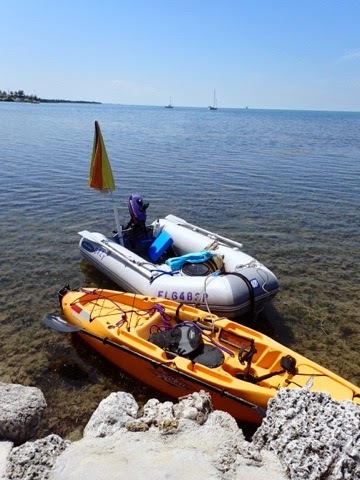 Diny uses a kayak as her dinghy as you can see in this photo as we parked ashore to visit the island known as Fiesta Key. There's a nice little campground on this Key with funky tiki huts and a little bar and cafe. Time for lunch! Although I love the trees of my native Georgia, I never tire of the palm trees swaying in the breeze over aqua blue waters. 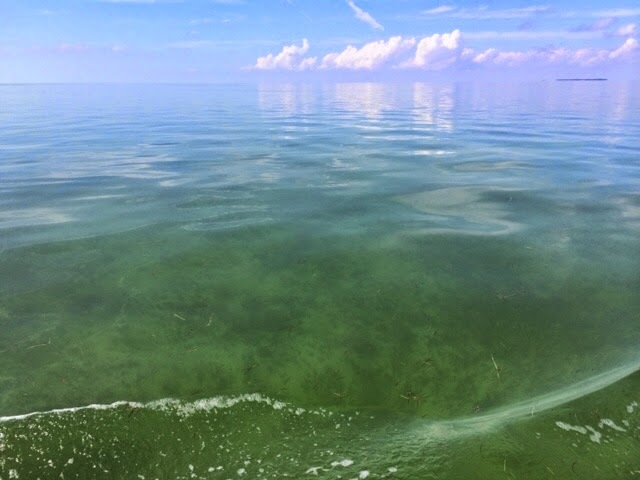 As I made my way deeper in the Keys, suddenly the water began to look more and more like the Bahamas-clear and calm. An eagle ray leaped high into the air as I approached the shore and a sea turtle darted out of the path of my dinghy. Good omens these are, I thought. We enjoyed a nice lunch dockside as we caught up on the news and travels from the past year. 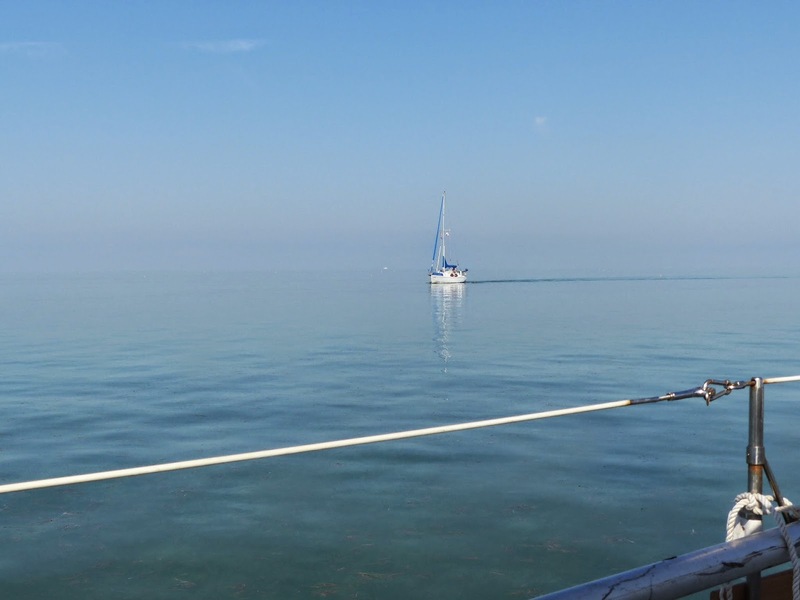 The seas were calm this week and the boats nodded ever so gently with the occasional squeak of a boom and a splash of a wave against a fiberglass hull. 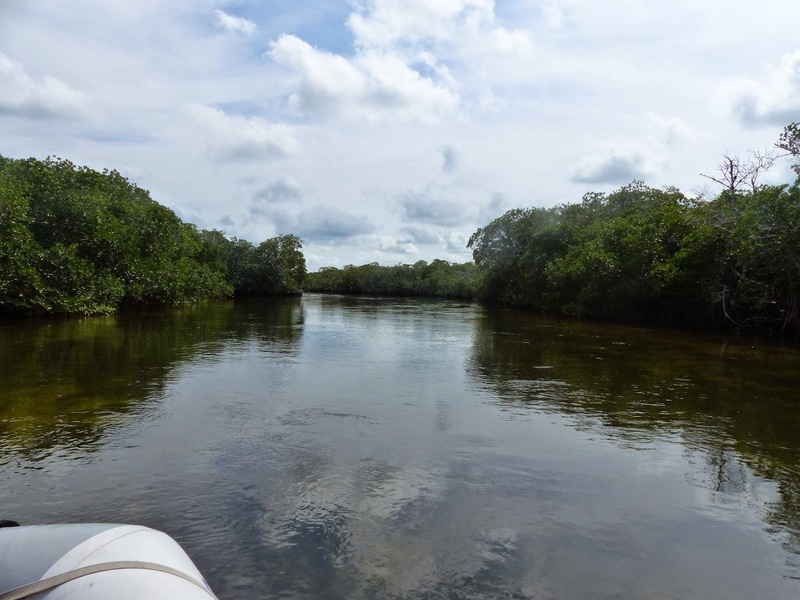 On Sunday afternoon, we opted for a day trip over to Long Key State Park… the outgoing tidal current was very strong but we managed to motor up the creek in the dinghy and enter into the park. 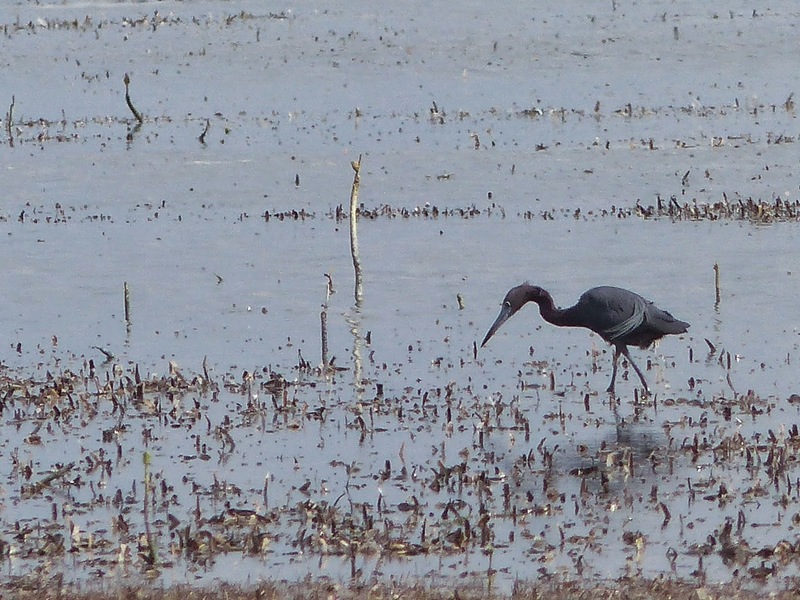 The tide was at its lowest, and these birds worked the mud flats for goodies to eat. new friends to help us stay young." 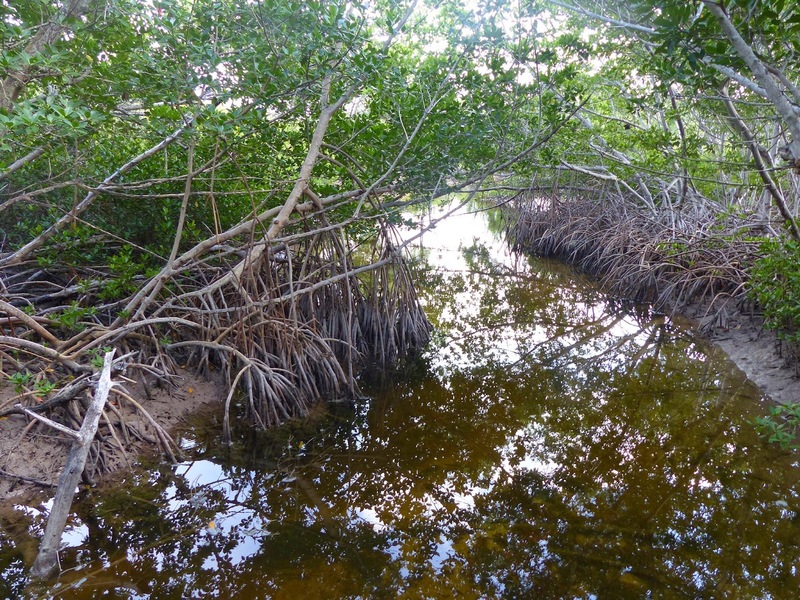 Here's another glimpse of the mangroves, a plant well known in the Florida Keys and south Florida. 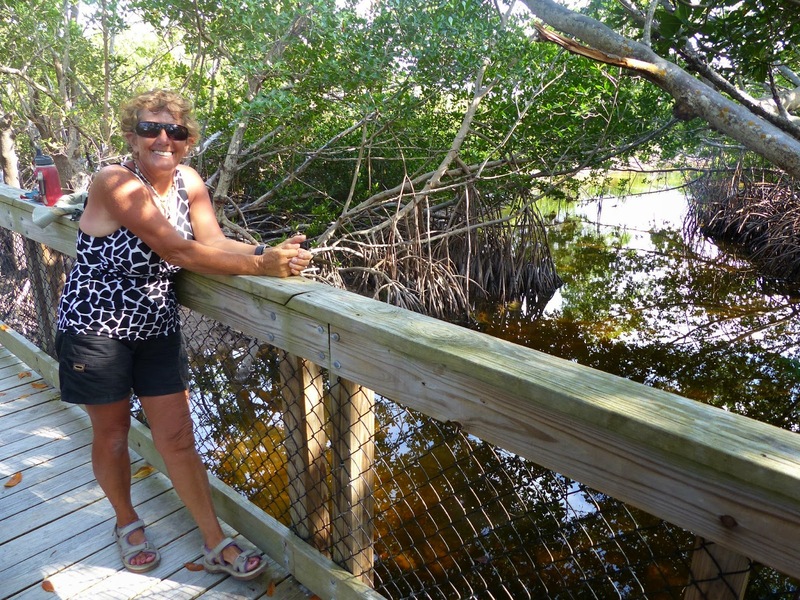 A nice day hike among the trails turned out to be a good idea although the heat was getting up in the mid 80's. 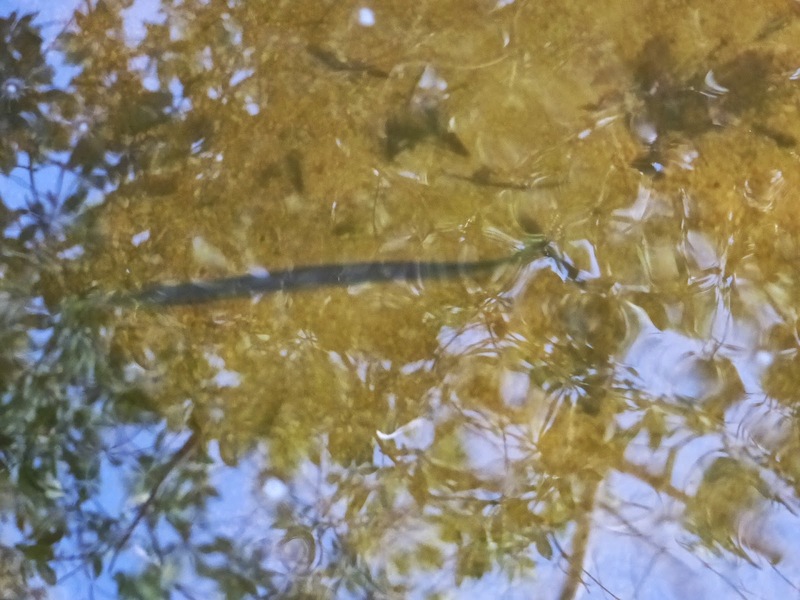 Ahhh, what a nice surprise along the trail! 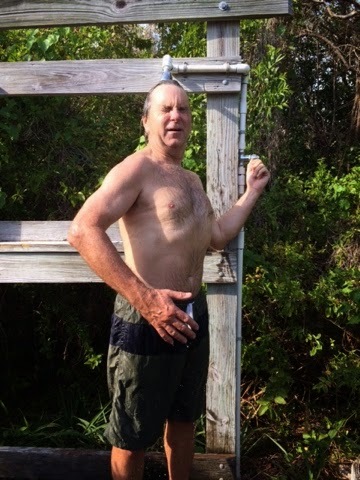 I never pass up the chance to get a free shower even if it is only cold water. Always carry a bar of soap and a towel in your backpack, kids. 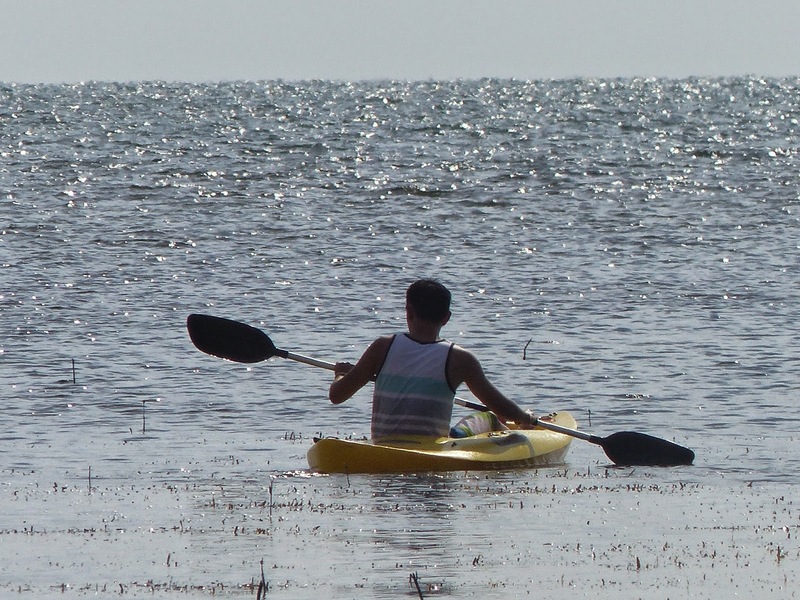 Luckily, the tide had not fully reversed so we were able to ride the outgoing tide. It looks calm, but the current is strong. So what's next for Diny Van De Loo? Diny has decided to take her vessel and complete what is known as The Great Loop. 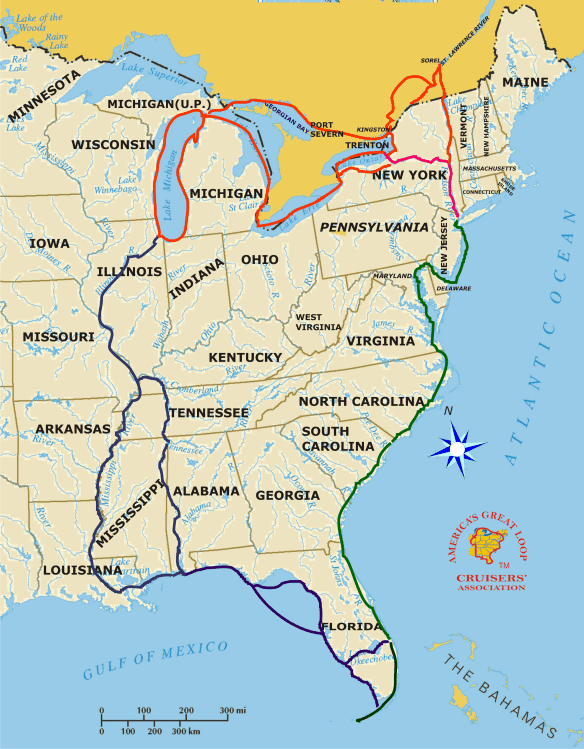 The Great Loop is a north American circumnavigation journey that can range from 5000 to 7500 miles depending on the route you take. Here is a map of the Great Loop to give you an idea of the grand size of this undertaking. Completers of this voyage are known as "loopers." 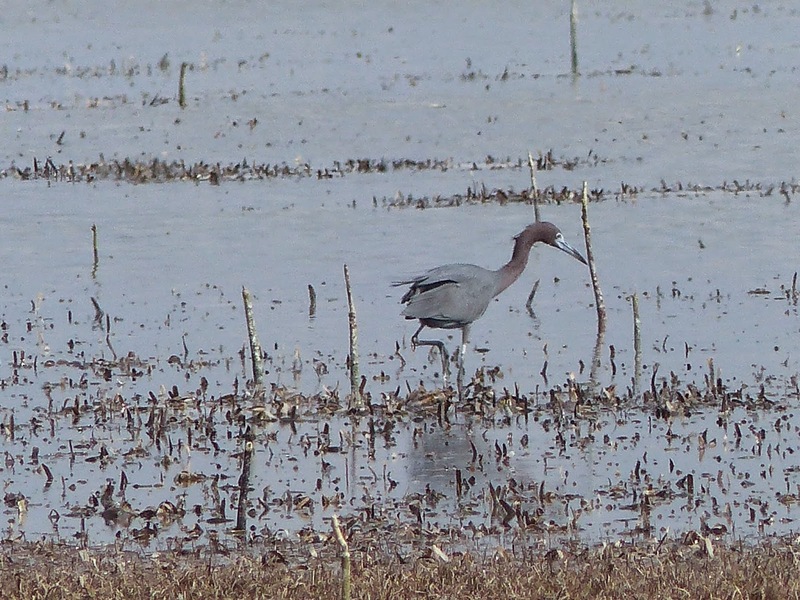 Here is a link to there organization if you'd like to know more about the trip. 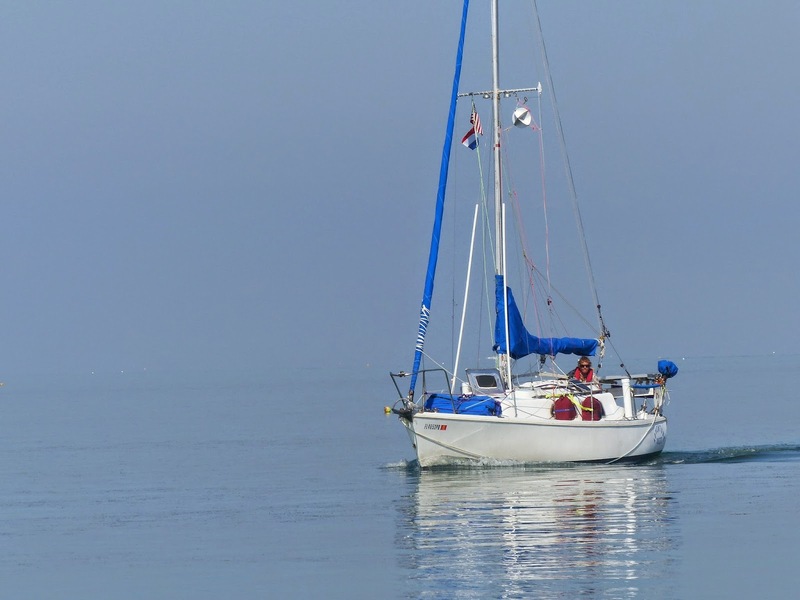 That's quite a long voyage for a single handler in a teeny sailboat but Diny's sailing skills are to be admired as she squeezes every wisp of wind into her sails to move her happily along. Granted, there will be a fair amount of motoring along The Great Loop. She figures the trip will take about 7-8 months. 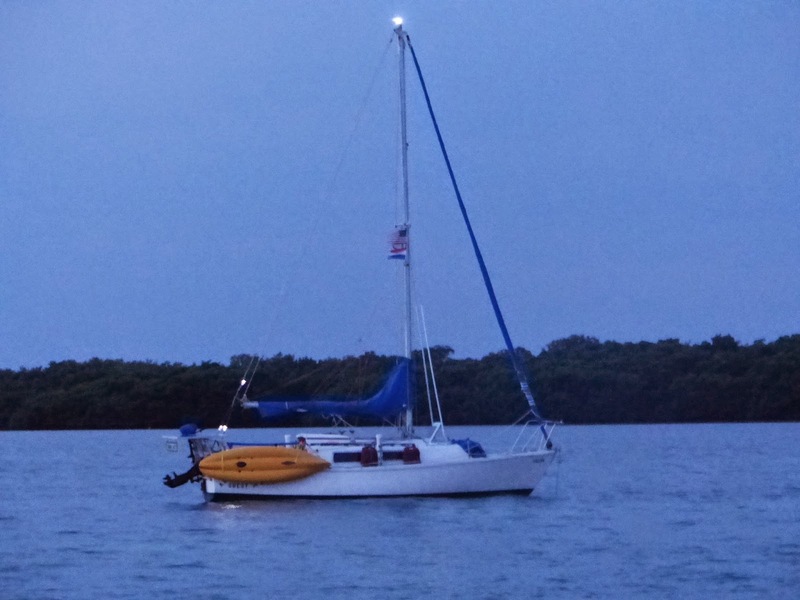 At daybreak on Monday morning, Adventure Quest was ready to depart north toward Miami and Fort Lauderdale as Diny begins her northern trek to prepare for the Great Loop trip. We parted ways and wished each other well in our separate travels. The only good thing about traveling in opposite directions is that each of us could share what's "up ahead" for the other since we've already been there. Many good stories were shared. ... she disappeared into the sunrise. If you'd like to know more about Diny Van De Loo and her world travels just google her. Below is the link to her travel blog. You'll also learn more of her nursing volunteer activities and some of her adventures as a snow skier and white water raft guide in her home state of Colorado. She is also on Facebook if you would like to see more of her photography and read about her philanthropic work and travels. * Her volunteer work includes teaching English in Nepal, 2004 and tsunami relief in 2005 as a nurse. * One month in Thailand, a few weeks in Sri Lanka and a year in Sumatra, Indonesia. *In 2009 various wildlife projects in South Africa, penguin rescue in Cape Town, and an animal sanctuary near Port Elizabeth. 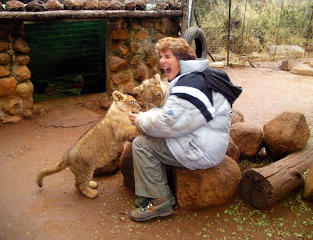 * Her personal favorite travel adventure has been raising baby lions south of Johannesburg. * She volunteers annually in L.A. with Catholic Workers feed the homeless in Skid Row. 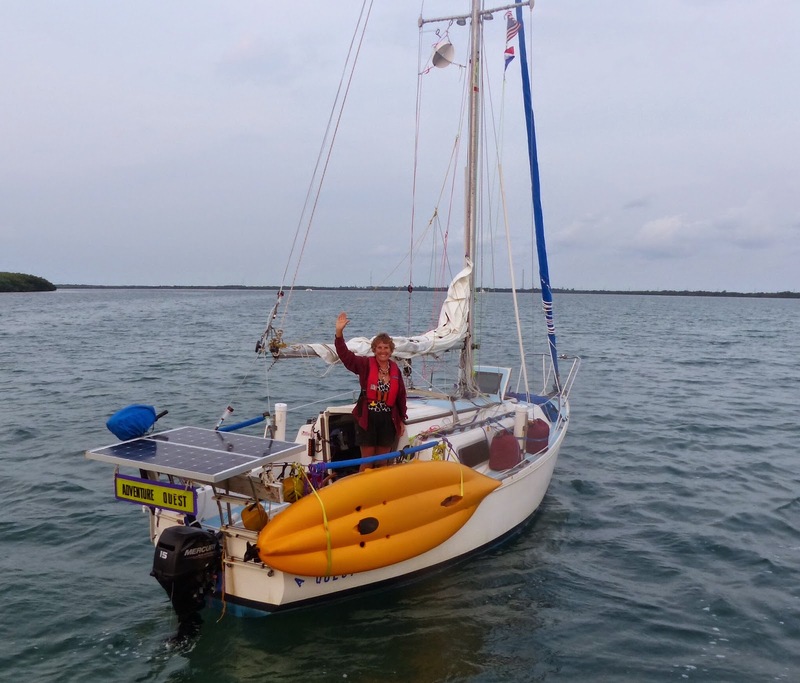 * Apart from all her volunteer work, she also finds time to serve as crew about various sailboats and fishing boats, most notably on a sailboat from Thailand, across the Indian Ocean, through the Red Sea and to Greece. All I can say is WOW! If everyone gave back as much as Diny Van De Loo, the world would be a far better place. It doesn't take great wealth to "sea the world" if you are willing to put yourself out there, befriend those you meet along the way, and keep on fishing for the next ADVENTURE QUEST. Fair Winds to you Diny! "You can make more friends in two months by becoming really interested in other people, than you can in two years by trying to get other people interested in you. " 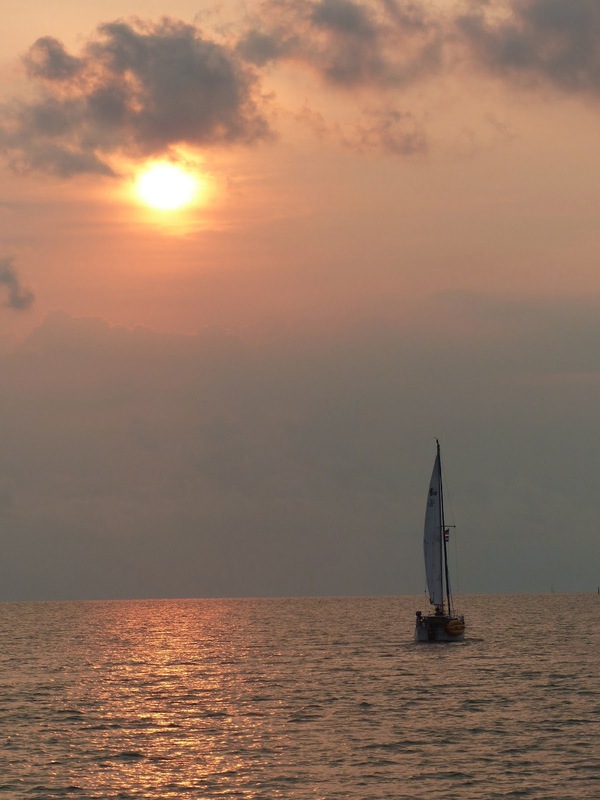 Stay tuned as Glory Days discovers Boot Key Harbour in Marathon, Florida and then sails off to Key West where good friends and visitors come for a nice taste of life on Glory Days! .... 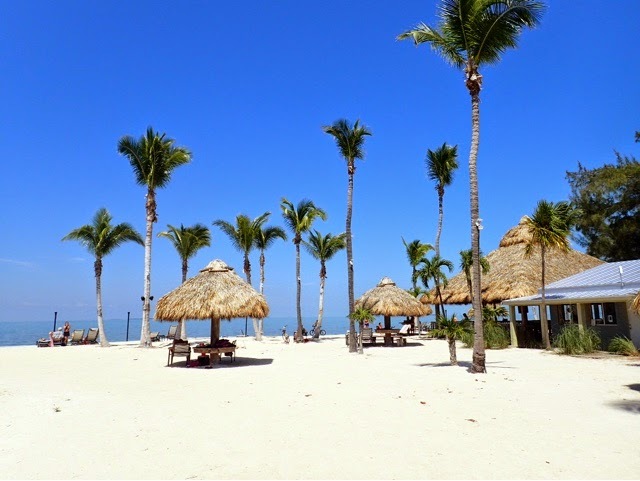 There's still lots to see in Key West so why not linger longer? !